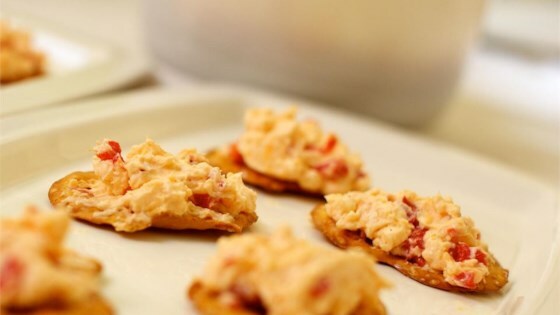 "This is the best pimento cheese you will ever have! Its creamy texture makes it excellent for sandwiches or for eating on crackers. Serve at room temperature." Beat the cream cheese at medium speed with an electric mixer until creamy; add Cheddar cheese and continue beating until light and fluffy. Beat in mayonnaise and garlic powder; stir in pimento. Cover and chill for at least 1 hour. Was ok not the pimento cheese recipe i was looking for. Lost my grandmothers recipe in a move from texas. Delicious!!!! Didn't realize it was so easy to make Pimento Cheese. If I'd known, I would have been making this years ago. I've made this and it's gone in the same day! Fabulous! I use roasted red peppers in a jar in place of the pimentos, a really good sharp cheddar, and light cream cheese. This was great. It reminds me of the Pimento Cheese my grandmother used to make. Use as a sandwich spread, or stuffed in jalapenos as an hors d'oeuvre. Thanks for sharing this recipe.